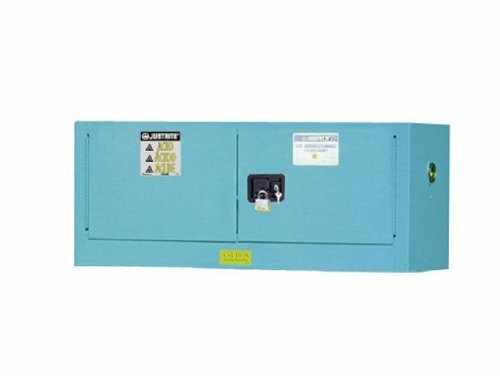 Justrite Sure-Grip EX galvanized steel 2 door self close piggyback corrosives safety storage cabinet. They can be used singly or stacked to provide additional storage. Piggyback cabinets also lend themselves to wall mounting or countertop use. Not to be used with sliding door cabinets. FM, N, O, U Approved. 12 gallons capacity. Blue color. Measures 43-inches width by 18-inches height by 18-inches depth. 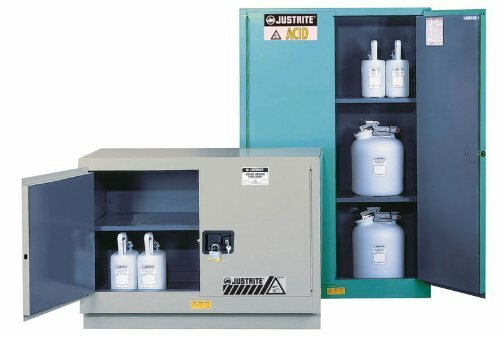 Justrite specially sized cabinets for corrosives offer a unique opportunity to customize work areas and make the most of available space. Whether adding to existing storage space or making solvents readily available at work station locations, these smaller sized cabinets are the solution when space is at a premium. Measures 23-1/4-inches width by 35-inches height by 18-inches depth. Justrite sump tray for use with blue polyethylene storage cabinets. Measures 31-5/8-inches width by 18-inches depth. 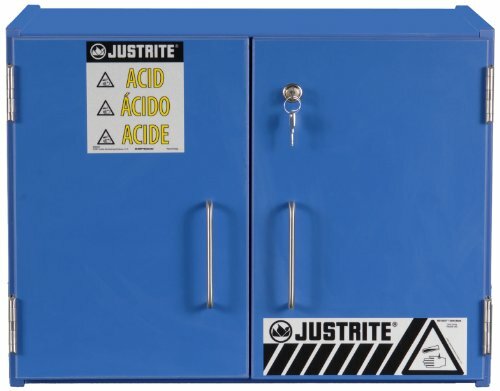 Justrite Sure-Grip EX galvanized steel 1 door self close compac corrosives safety storage cabinet with 1 adjustable shelves. Specially sized cabinets for corrosives offer a unique opportunity to customize work areas and make the most of available space. Whether adding to existing storage space or making solvents readily available at work station locations, these smaller sized cabinets are the solution when space is at a premium. FM, N, O, U Approved. Measures 23-1/4-inches width by 35-inches height by 18-inches depth. 12 gallons capacity. Blue color. 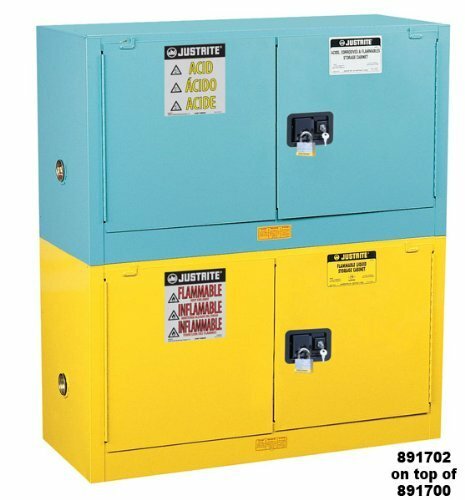 Justrite's exclusive ChemCor lined acid safety cabinets are Piggyback styles. 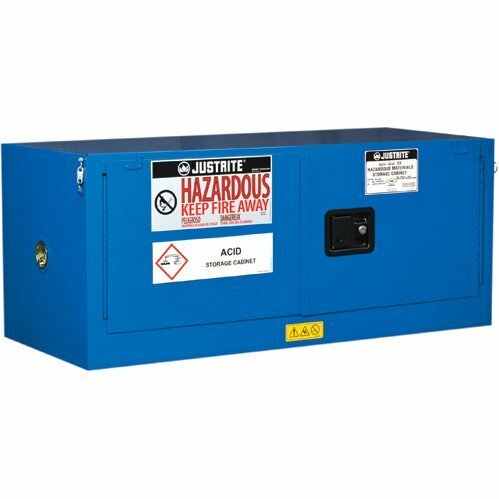 Models have the quality features including double-wall, 18-gauge welded steel construction, 2-inches liquid-tight containment sump, dual vents, adjustable shelves, three-point stainless steel bullet self-latching doors with ULoc padlockable handle and Haz-Alert reflective warning labels. Interior ChemCor liner ensures complete corrosion resistance and protection. popular light blue color to complement laboratory settings. 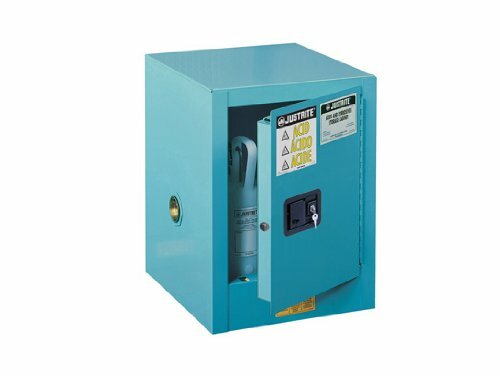 ChemCor lined safety cabinets include two labels to be placed on the cabinet by the end user: "Base" or reflective Haz-Alert "ACID" depending upon contents stored. Shelving adjusts on 3-inches centers for storage versatility. FM, N, O Approved. External measures 43-inches width by 18-inches height by 18-inches depth. 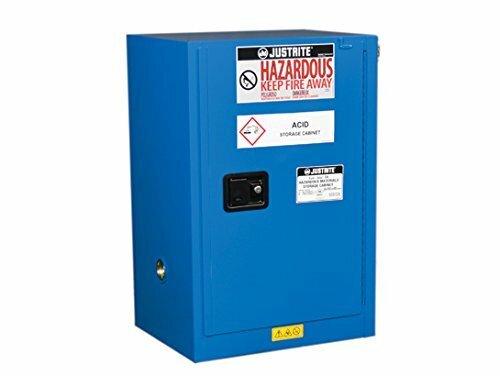 Justrite Piggyback Hazardous Material Safety Cabinets have the same quality safety features as the cabinets for flammables. All models come with double-wall construction, dual vents, grounding wire connections, adjustable shelves, leak-proof sills, three-point self-latching doors and leveling feet. Self-close door(s) shuts and latches automatically when a fusible link melts at 165°F (74ºC) under fire conditions. Unique, concealed self-closing mechanism offers obstruction-free access to contents. 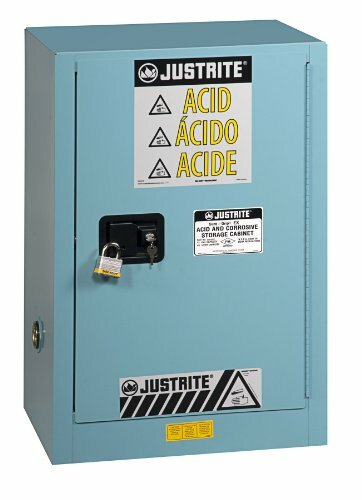 Justrite self-closing countertop acid safety cabinet. Blue color. 4 gallons capacity.